Derek Rutter wailing on guitar and vocals. Chris Rader at Hanger 9. Matt Gadeken & Justin Torres tearin’ it up. Clusterpluck, an “upbeat, hillbilly, hippie extravaganza” and a cross between Newgrass and Americana played Hanger 9 in Carbondale, Illinois. 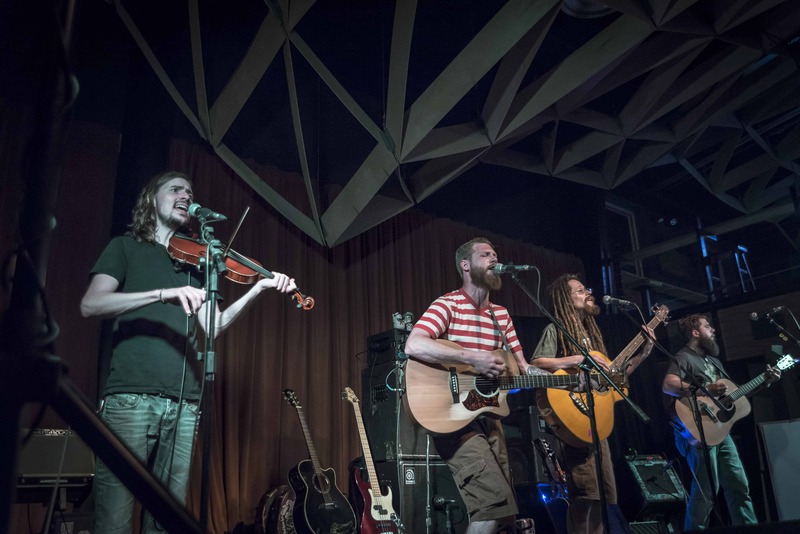 The tunes are upbeat and catchy mixing bluegrass, rock and country into a hearty sonic stew. The boys have thrown tradition aside, utilizing banjo, guitar, bass, violin, mandolin, and even dobro. 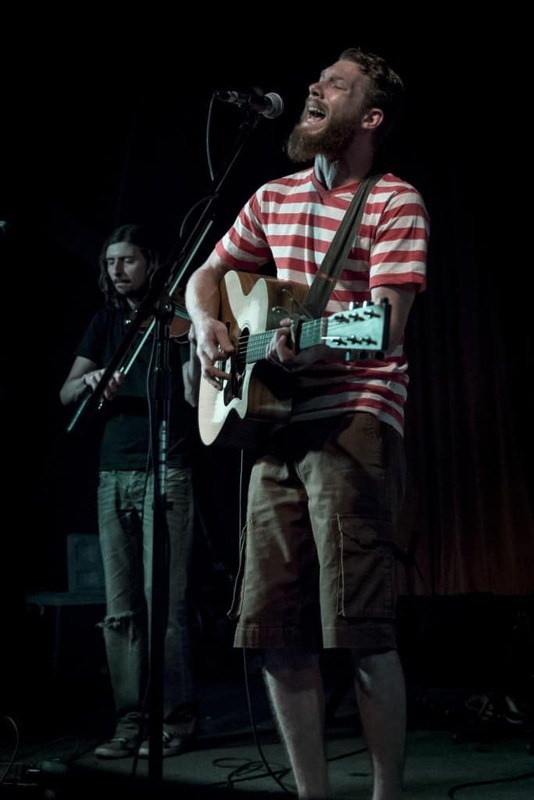 The band is based out of Southern Illinois around the St. Louis, Missouri area, and in the last few years they’ve been touring, and developing a strong following. They released two albums in 2013-2014 and an EP in 2015—and are currently working on a 14-song album due out in September 2016; which will be the band’s first as a four piece. They are excited for the release of it. “We never want to change our sound but at the same time we want to keep it fresh for us and our fans,” explained Rader. 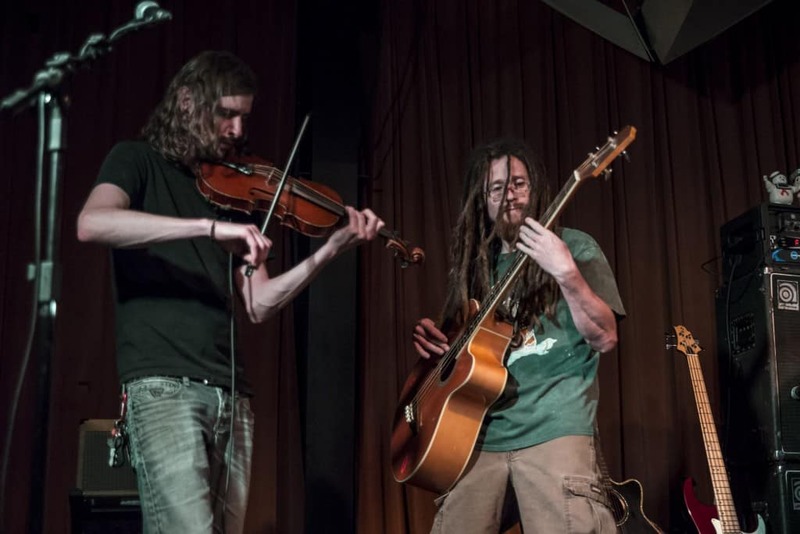 At the band’s core, are Chris Rader (Vocals, Guitar, Banjo, Dobro, Mandolin) and Derek Rutter (Vocals, Guitar, Mandolin, Bass, Kazoo), who grew up playing music together from a young age, gigging at bars and clubs throughout their high school years up. Justin Torres (Vocals, Bass, Guitar) was a solo-looping artist who met the duo when he opened a show for their band Leveled. A friendship sparked and the three vowed to someday start an acoustic band where they could focus their efforts on songwriting. Fast forward three years later, around the fall of 2010 when the three musicians got together for their official first practice. They learned a few of each other’s songs and wrote a few during these first few practices and felt they were “on to something.” It was during this early period that Leah Osborne joined them on vocals, washboard, and ukulele [Editor’s Note: as of this printing Osborne has left the group to spend more time with family and focus on her culinary career]. Up to this point, the band had been trying to figure out what was missing from their sound. Right about that time, Torres met Matt Gadeken (Vocals, Violin, Mandolin, Guitar) at an open mic and Gadeken ‘s violin style was a perfect accompaniment. Ironically, Rader and Rutter realized they had met and played shows with Gadeken in the past, but hadn’t seen each other in a several years. M&M: When did you all start playing music? Rader: I started playing around the age of 12, on a hand me down guitar that used to be my uncle’s and I never looked back. I went from playing with action figures to basically wanting to play music all the time. Rutter: I started playing guitar around the age of ten, but not seriously till about 12 or 13. Torres: I was 20 when I bought my first guitar. I was at a friend’s house and a guy was playing some songs on guitar. He encouraged me to try it out and showed me a D major chord. I was hooked! I bought one a few days later and practiced chords and progressions everyday for hours. Growing up my dad always played music. As long as I can remember I was always around it. Gadeken: I started with piano lessons in about 3rd grade, and playing violin in my school orchestra in 4th grade, and gradually added instruments from there. M&M: Where are you guys from and what was music like where you grew up? Rader: I grew up in Walsh, a small farming town in Southern Illinois. Growing up there were a bunch of Country and Classic Rock bands in the area, mostly top 40 bar bands that you could see on the weekends. There were, and still remain, a bunch of super talented working class players in Southern Illinois. When I was 21 I moved to St. Louis and started seeing and hearing a lot more styles and sounds. Way more blues and jazz bands, way more players that make you look on in awe and frustration. The country and southern blues rock side of my playing sticks out no matter what I do but St. Louis has such a diverse cache of music going on that new licks and tricks are a given. Torres: I was born in Los Angeles California and grew up around Culver City, Venice Beach, and Manhattan Beach. We ended up moving to Fort Smith Arkansas and that’s where I spent my Junior High and Senior High School days. I moved back to California after I graduated and it’s a long story how I ended up in this area but I love it. Gadeken: I was born in Iowa, moved around a little, and ended up here. Growing up in the Midwest has definitely had an influence musically. M&M: Who are your favorite musicians? 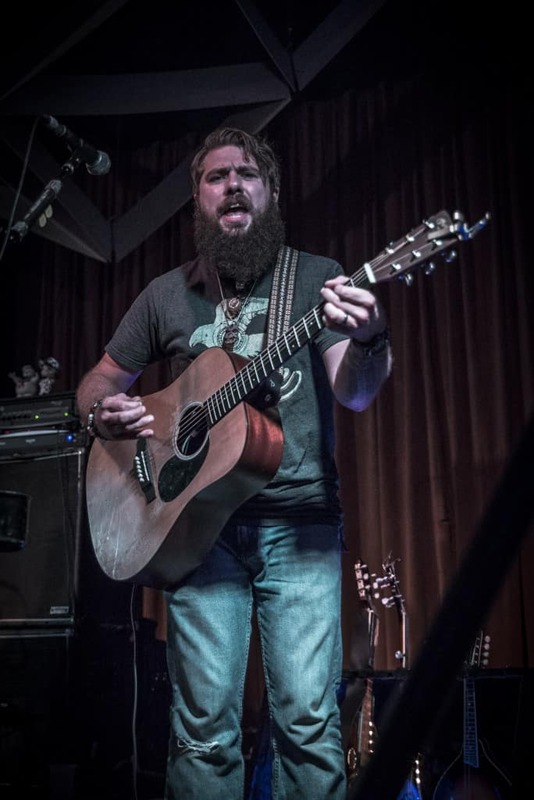 Rader: My favorite musicians are in no specific order Waylon Jennings, Johnny Cash, Willie Nelson for their undeniable ability to make you believe they are living proof of the songs they sing. Stevie Ray Vaughn, any Allman Brothers Band Guitarist, All the 90’s Country Lead Guitarists, Mike Campbell from The Heartbreakers and Tim Reynolds. They’re guitar styles inspire most every song I play. Rutter: The Allman Brothers, Willie Nelson, Stevie Ray Vaughan, John Prine. I have a lot of favorites. Torres: String Cheese Incident, Taj Majal, Keller Williams, Greensky Bluegrass, Jackie Greene…this list could go on for a pages. Rader: ClusterPluck came from an anonymous Facebook friend. After those first few practices we put together a rough demo of songs and put them on Facebook and asked what we should call ourselves. We were having a hard time thinking of a name for the band and just liked the idea of having people interested in what we were doing help. After a ton of suggestions of names that sounded like traditional bluegrass bands, which we did not sound like, we noticed ClusterPluck. It fit perfectly and always catches people’s attention and leaves them with a smile. M&M: Tell me a little about your songwriting process and style. Rader: Our songwriting is always different. We have songs that were written solely by a specific member, we have some where two or three of us wrote the majority of the song and we have a few where we all had a part in the writing. We all have our own styles though, that’s for sure, but despite our individuality, our songs contain these threads of cohesiveness even when written apart from each other. We don’t stick to one exact genre or style but once we are all playing it becomes our sound. M&M: What are you favorite songs to play live? Rader: Probably “Miles” which is a Rutter song. I play space guitar on it through the whole song and use crazy effects like echo, reverse, wah and whammy pedals. It’s an awesome, hard-hitting jammin’ song and it’s one that usually leaves people a little stunned because we are technically an “acoustic” band. Rutter: My favorite song we play live is “Hidden Acres.” I’ve always liked it since the first time I heard it…plus I get to jump over and play bass on it. M&M: Tell me about the songs “Drivin’ On” and “That Old Sunrise”—how did you come to write those two pieces? Rader: “That Old Sunrise” was written by Justin [Torres] and myself in Oklahoma at sunrise. We had played a late night set and found ourselves at a campfire after we were finished and packed up. Luckily I had a guitar with me as inspiration struck and we quickly were off to find paper and a pen. The song is a tribute to those who we love but leave back home so often while on the road. For every sunrise you’re another day and another mile closer to being back in their arms. M&M: Who does your band’s artwork and touring posters? Rader: The artwork is done by artist Jon Griffin, www.jiveafro.com, who does a lot of artwork for bands and artists in our genre across the Midwest, or Artist Amber Feig, af[email protected] They have helped us immensely in putting a visual element to our music. Chickens have become our main mascot. Seems to fit with the hint of bluegrass and pluckin’. We have a few songs referencing Pirates so they too have become mascots. M&M: Any life changing experiences for you guys? Rader: We had a van wreck a few years back. We were all completely fine, but the van, was totaled, and we lost some gear. It was a really crazy experience to see the destruction that we made it through—we came so close to tragedy. It was an eye opener to being safe on the roads when traveling long distances. We are all lucky to be here. Rader: People love pirates and so do we. We shot a music video of sort at our favorite spot in St. Louis, Missouri. The Broadway Oyster Bar, and told everyone to dress up crazy. There were a lot of pirates at that show. M&M: Well you do have a song called, “Pirates In A Bathtub”—which I understand is Rutter’s favorite ClusterPluck song. Rutter: You can’t go wrong with a Kazoo fiddle mashup.